Outside of gymnastics, you seldom see people performing handstand push-ups. The first time I can recall seeing them in a strength training situation is when recommended by New Jersey based strength coach Jason Ferruggia. I first read about them in THIS article that I can’t recommend enough, and from videos on his YouTube page. Other than his work, they are popular in CrossFit circles, but in few other places. I think that too many people group consider them too difficult or too dangerous, and that other exercises can get the same job done. 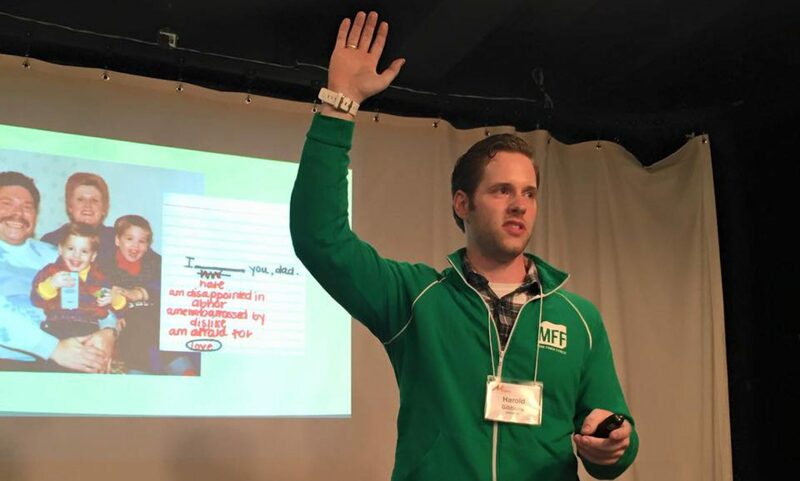 Some, like me, just never really thought about how to implement them into their own programs. As of my 8am Stunts and Tumbling class on Friday morning, I can say that they are here to stay. My parents had me involved in gymnastics when I was much younger, but I don’t find myself in any way to be gifted at these things. 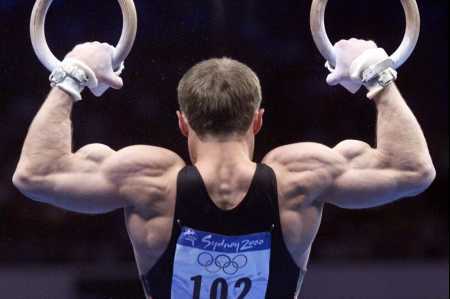 If I could go back, I’d tell them to force me to stick with it, because gymnasts are a perfect example of functional strength. They’re ridiculously strong using entirely body weight exercises, they have awesome kinesthetic awareness, and they can get pretty damn jacked. Not a bad place to start for not ‘lifting weights’. This past Friday in Stunts and Tumbling, we gained our first introduction to a balance series that eventually leads up to the hand stand. During class, we were presented with the Tip-Up, Tripod, and Headstand. Due to balance and spotting issues, a mat was placed against the gymnasium wall so students could practice their headstands with a bit of extra support. Together overzealous, my partner and I decided to try to move from headstands into handstands. A regular at CrossFit Long Island, Tom has been working on his hand stand push-up, so he gave me some pointers on the exercise. The whole hand-balancing thing gave me more problems than the strength component, and I could bang out a few reps at a time while my feet were gliding along the wall. In fact, to mess around with the handstand pushup a little more, I subbed that in for a military press; soreness has ensued. Since performing that workout a little over 48 hours ago, I’ve had some pretty profound soreness in my mid-back, between/underneath my shoulder blades. It’s a muscular soreness I’ve had before from half-kneeling overhead pressing with dumbbells, but not (recently) from barbell pressing. To me, that’s a clear indicator that I need to perform hand stand pushups more often, and that it’s an exercise that you should be doing as well. The progression that we used in class was simple. It began with a tip-up, that involved squatting with your elbows inside your knees, placing your hands on the floor, and rocking forward to support your body weight on your hands. This is basically a ‘crow pose’ from the world of yoga, and THIS article can help you achieve this position. Following the tip-up crow pose, we moved on to a Tripod Balance, which introduced students to supporting weight on their heads. (Note: If you have a head or neck injury, or if you have the coordination or body awareness of a dust bunny, you might not want to try this.) You can click HERE to read a quick explanation of how to achieve the Tripod Balance pose. 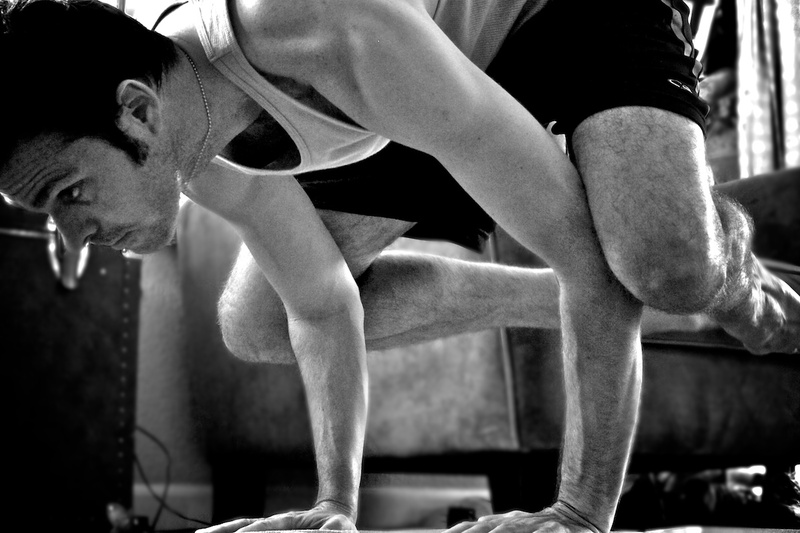 The final step, after the Tripod Balance pose, is simply straightening your legs up overhead, into a full on headstand. Easy-peasy, right? Well, not exactly. See, this doesn’t exactly teach you how to transition from the headstand into a handstand, which is something that Tom and I figured out on our own; we both just pressed hard enough on the floor to raise ourselves up off of the ground. If you have the strength to do this, than you will certainly find this a sufficient way to find yourself performing a handstand push-up. If you haven’t been military pressing or find traditional push-ups difficult, you may want to try another learning sequence for this. If that’s the case, I would recommend THIS link from BeastSkills, or THIS link from DrillsandSkills.com. 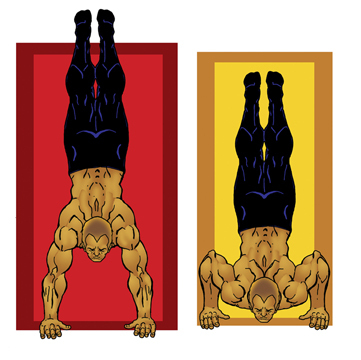 Both offer complete guides to performing the handstand pushup. Handstand Pushups are hard. They require you to support your entire body weight on your hands, and require strength and stability in the shoulders. You need to brace your glutes and your abdominal musculature to maintain proper posture through out the exercise. Read the articles I’ve linked to, perform the balance positions and yoga postures, and work your way up on to your hands. You’ll feel good, you’ll look good, and if you start soon, you can track your progress with the exercise as I track mine. Let’s get strong.